Previously, World Wide Developer Conference (WWDC 2014) held this Year 2014 was mainly a new software and latest programming tools oriented event by Apple, So today at September 9th, 2014 Media Event, Apple iDevice users can expect the event more towards hardware oriented. Today, at Apple's Sept. 9, 2014 Event Keynote's, The expected hardware + software releases and announcements would be; Two new iPhone models i.e. 4-7 inch iPhone 6 or 5.5-inch iPhone 6, iOS 8 Golden Master Firmware, iWatch, Sixth-Generation iPad Air 2 (6G), Mac OS X Yosemite 10.10 Final Build Version and lots more surprises by Apple. According to allegedly leaks and rumors spreading all over the internet, the specifications and features of iPhone 6 would be a 4.7-inch and 5.5-inch display screens, at least one of which supports NFC (Near Field Communication) features for a new mobile payment system and will have a wireless charging feature. iPhone 6 battery would be powered by all new 2,915 mAh battery. It's also expected that, iPhone 6 will be a water-resistant smartphone having the front panel of the device to be "shatter-proof" with "sapphire glass". According to sources; China Mobile and other retailers have already started getting pre-orders of iPhone 6 smartphone, which is expected to be available to general public from September 19th, 2014. 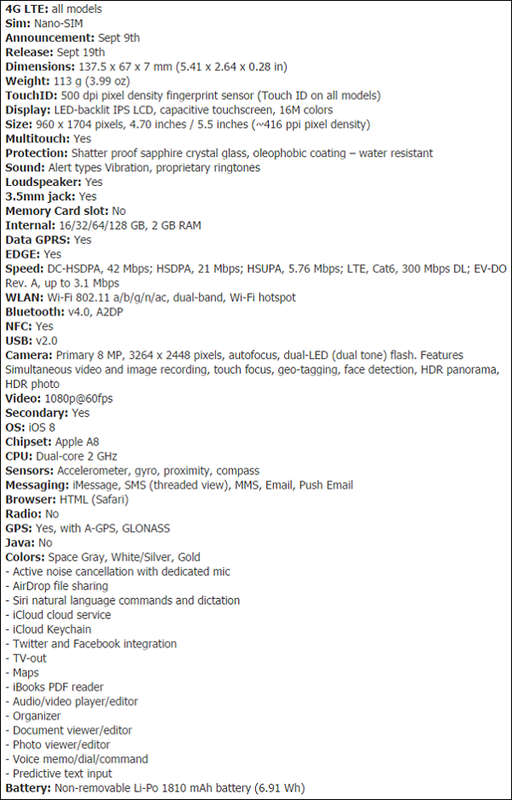 You can see full allegedly iPhone 6 Specs and Features in below image. You can also watch an allegedly Video of iPhone 6 Running iOS 8 GM Firmware. The iPhone 6 in below video is a 64GB white and silver model with iOS 8.0 (Build: 12A365) Firmware running. 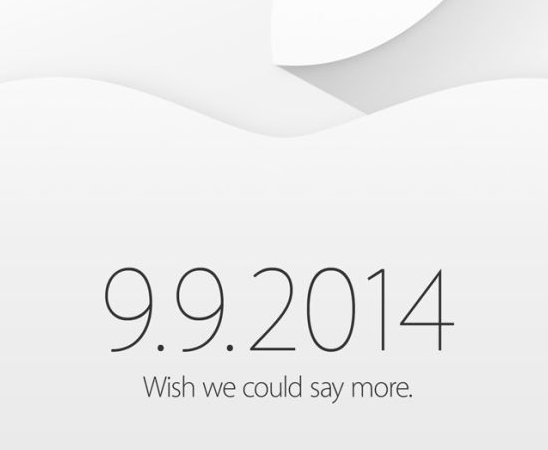 iOS 8 Final Version (GM) is also expected to be released at September 9, 2014 Special Media Event today. The allegedly functionalities and features of iOS 8 Gold Master could be; Mail, Safari, Messages, QuickType, Continuity, Handoff, AirDrop, Instant Hotspot, Health, iCloud Drive, Family Sharing, Photos, Camera, Third-Party Keyboards, Interactive Notifications, Spotlight, and Contact Shortcuts with the addition of some little more surprise changes i.e. split-screen multitasking feature for iPad, or an improved maps app. According to BGR reports; Apple is already preparing to seed new version of iOS 8.0.1 Firmware for testing and experimental purpose to its official partners. Apple iOS 8.0.1 Firmware could be seeded shortly, just after the release of iOS 8.0 Firmware to consumers. According to some leaks and speculations, the allegedly specs and features of iPad Air 2 sixth-generation would have anti-reflective laminated display, Touch ID, and a gold color option. At today's main event, it’s expected that Mac desktop and laptop device users will also get the final build version of OS X Yosemite 10.10.
iWatch's allegedly specs and features may contains; Sensors, HealthKit infrastructure, Sapphire glass coated, Squarish device design with rounded off corners, 1.3-inch and 1.5-inch display screens for men and women. iWatch will also be powered by a wireless charging technology. iWatch will have 512MB of RAM, 8GB of storage capacity and have a gold color. NOTE: Above mentioned all the details, specs and features are unofficial, and totally based on Rumors, Speculations and Leakages spread all over the internet.